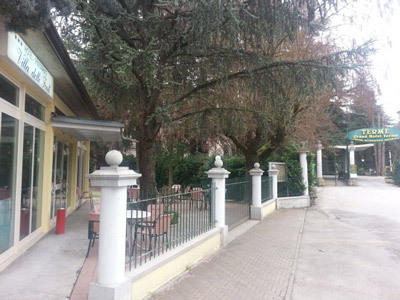 Hotel Villa delle Fonti is located within the Park of thermal area Parco delle Terme, at 10 meters from the main entrance of the facilities. The Terme di Riolo, openeed in 1870, are in a magical setting : a vast park of twelve acres surrounded by hills covered with vineyards . Hotel Villa Delle Fonti boasts a privileged location which allows you to enjoy the greatest peace and follow the slow rhythms of nature. Away from the bustle of the big city, the spa invites you to experience the ancient rituals of beauty and physical health . Advanced diagnostic and therapeutic methods together with precious natural remedies such as the excellent medical waters , the fine mud springs, the herbal extracts and essential oils will give you moments of total relax and happiness. The springs of Terme di Riolo include sulphurous water rich in mineral salts, bromine and sodium chloride and iodine, used to treat the digestive tract or diseases such as asthma and respiratory infections. The thermal waters from Riolo have chalky – sulphurous origin , in fact they come from the “Vena del Gesso” (Gypsum vein) which extends between the Senio valley and the valley of Santerno . For the entire season, from June to September , many events are organized in the park: dances, shows, bingo games and evening markets where you can buy local products and specialties. On Sundays and Mondays, we dance also in the afternoon hours.